I know what some would say, but they’ve got it all wrong. No one in their right mind would want this power and the responsibility that comes with it. Definitely not me. I’m not a superhero. I’m just Jax, freak extraordinaire, and this is my story. 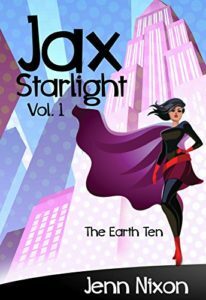 It’s apparent in Jax Starlight that Jenn Nixon is an avid sci-fi fan. She knows the tropes and how to work them so that they seem new and fresh. Jax Starlight is the hero(ine) in this story. An orphan barreling through space on a spaceship filled with the last of the Earthlings, she does whatever job she can to survive until they can find an inhabitable planet. Of course, she wasn’t planning on crash landing or growing stronger with each passing day. With only a few humans surviving and paranoid inhabitants (rightly so–to find out why, you’ll need to read the book), Jax and her friends must learn to rely on their new friends and control their powers. It is first person, which isn’t my favorite viewpoint, but Ms. Nixon did an excellent job handling that. The only reason I rated it 4.5 stars is because of the first chapter. In my opinion, the first chapter wasn’t needed, but it was only a page. We jumped right into the action in chapter 2. I hope Ms. Nixon continues with the Jax Starlight series. I want to know how she learns to cope and what happens next.